If you’re pushing yourself hard in the gym, you should back it up with quality nutrition otherwise all your effort can go to waste. Super Max is a scientifically designed formula that provides your body with the nutrients needed to turn your training into stronger muscles. While slow-release proteins should be consumed at bedtime, recent studies show that it’s beneficial to take in fast and slow-release proteins at the same time, especially after workouts. That’s why Super Max combines whey isolate, whey hydrolysate, egg albumen and micellar casein – all of which have different rates of absorption. In other words, Super Max is engineered to be your powerful all-in-one protein source, from after gym to after dinner. As any sports nutritionist will tell you, the quality of your nutrition can have a profound effect on your muscle recovery and growth. Research also shows that consuming protein blends may be superior to whey or casein alone, especially after a workout and before bedtime. That’s why Super Max has been formulated with a variety of fast and slow-absorbing proteins. We’ve selected the highest quality whey isolate, hydrolysate and concentrate to give your muscles a near instant hit of protein. These proteins are followed by soya protein isolate and egg albumen, which are the medium-release proteins in our blend. Last but not least, micellar casein is absorbed the slowest, so that you have a long-lasting supply of protein for your recovering muscles. That’s why it’s called Super Max – it’s the perfect protein blend to max your results after your hard work in the gym. Super Max is part of the Super7® range: a series of seven premium quality supplements designed for guys who hit it hard in the gym. Each supplement is scientifically formulated with seven industry-leading ingredients. IS SUPER MAX RIGHT FOR YOU? If you’re looking for the perfect all-in-one protein shake for after a workout or before bedtime, then yes it is. The proteins in Super Max are scientifically proven to boost your muscle recovery and growth. You get premium quality whey, soya, micellar casein, milk proteins as well as egg albumen. We’ve got you covered with a wide range of other performance products: Super7® Super Gain, Super Fuel, Super Charge, Super Lean, Super Burn and Super Armour, as well as Bio-Synergy Whey Better®, Essential Sports Fuel® and Insanity. As with all our products, the Super7® range is made from only the highest quality, locally sourced ingredients. Whey Protein Hydrolysate, Soya Protein Isolate, Milk Protein, Whey Protein Concentrate, Micellar Casein, Egg Albumen, Whey Protein Isolate, Flavouring, Cocoa Powder, Sweetener (Sucralose). Take one 30g scoop with 300ml of water or milk. 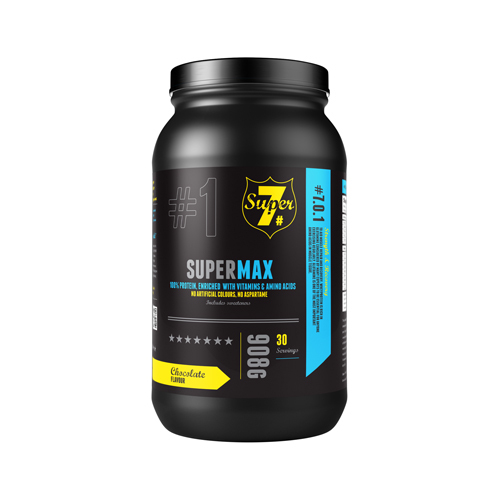 Super Max can be used any time of the day but we suggest using it after a workout and at night and then any time where you struggle to get in a protein rich meal. "This gives my body the daily protein intake a need together with a very tasty flavour which I love anyway. Harlow"